Members in the original Old Farts Car Club from the state of Georgia. Check to see if your name is in your state, let us know. This the only existing roster that we could find for the Old Farts Car Club from the state of Georgia. Below are the names from the state of Georgia. See if your name is on the roster from Georgia. Georgia has been a favorite state for the Old Farts Car Club. We have many friends here and attended many rod runs and swap meets with the Old Farts Car Club Senile Safari. Goodguys has had several rod runs here over the years from Conyers to Perry and it is home to one of the coolest rod runs ever, the Moonshine Festival in Dawsonville. A quick click here will take you to our companion website Hotrodsonline.com and coverage of the Moonshine festival covering several years. Here is a picture from the state of Georgia and Dennis Hubbard and the ''Rodfather'' Andy Brizio at the Goodguys meet in Conyers Georgia. 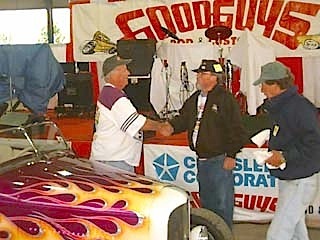 Andy has driven all the way from California and made most of the Goodguys events that year. Andy still has the roadster and I caught up with him when we made our bucket tour in 2009. He was at the NSRA nationals in Louisville with the same roadster. Check it out here. In 2009, My brother and I went across country with the Ridler award winning 1932 Ford Deucenberg owned by Doug Cooper and we recorded the trip at Hotrodsonline.com Click below.